Two pieces of good news in one day (shortlist of PPOTY)! Have just been told that my photograph, A Portrait Of Maya, has made the shortlist of 15 images chosen by public vote in G-Tech’s Driven Creativity Competition 2013. I’d like to thank everyone who voted for the image. Lets all keep our fingers crossed for the judging, the results of which will be announced on November 15th. Photographer Edmond Terakopian stands by his picture "Love Your Job" which came second in the Driven Creativity contest and exhibition, sponsored by G-Tech. The Strand Gallery, London. October 13, 2011. Wonderful evening at the Strand Gallery at the opening of the Driven Creativity competition sponsored by G-Tech. 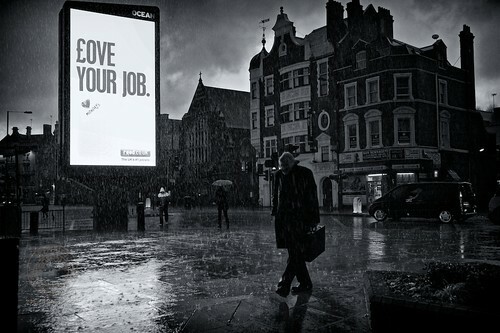 Thrilled that my picture, ‘Love Your Job’ was chosen as runner-up in the professional photography category. Several amazing images, including a stunner of a homeless man on the Millennium Bridge and some wonderful films as well. Well worth a look. Check with the gallery on opening times as it’s not on for long. I’m thrilled to say that this image has made the shortlist for the Driven Creativity shortlist and will be exhibited in London, Paris & Berlin. The winners are to be announced on September 23rd, so fingers crossed! The pictures was taken on a Leica M9 with a 35mm Summicron ASPH lens and processed in Aperture and Nik Software’s Silver Efex Pro 2. Many people voted for this shot to go through for judging and I wanted to say a big thank you to you all; very much appreciated! !